Euro is still being corrected; bulls may break June’s high during the day and reach closest group of fibo‑levels at 1.3695 ‑ 1.3685. If pair rebounds from these levels, price may start new correction. As we can see at H1 chart, upper targets are confirmed by several additional fibo-levels. According to temporary fibo-zones, predicted targets may be reached today. If price rebounds from them and reaches new local low, I’ll start selling during the following correction. Franc is still forming descending correction. 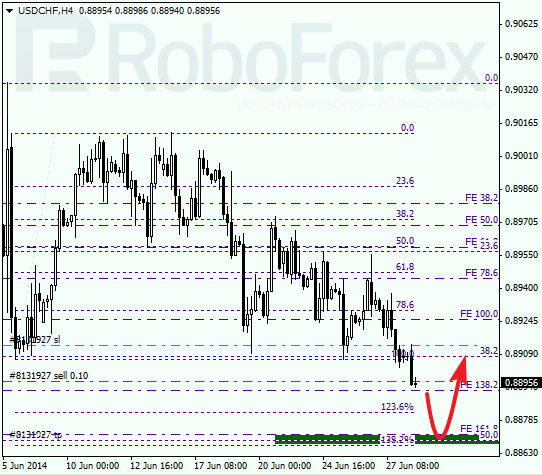 price broke June 5th low and right now is moving towards closest group of fibo-levels at 0.8870 ‑ 0.8865. If pair rebounds from these levels, price may start new ascending correction. As we can see at H1 chart, lower targets are confirmed by local fibo-levels. According to analysis of temporary fibo-zones, predicted target area may be reached during Monday. We should note, that price breaks this target area downwards, I’ll open several sell orders during the following correction.